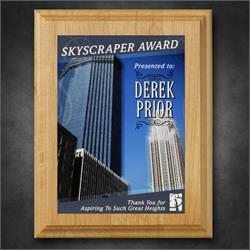 Each award is made of Alder Wood Natural Finish. 7" x 9"; 1.5 lbs. 7" x 9"; 1 lbs. 8" x 10"; 2 lbs. 8" x 10"; 1.5 lbs. 9" x 12"; 2.5 lbs. 9" x 12"; 2 lbs. Please allow one week production time after proof approval before this item ships. Item Size 7" x 9"
Item Size 8" x 10"
Item Size 9" x 12"